…meanwhile, she desperately applied the various topicals and solvents she could find to try to undo the glued fingers on not one, but BOTH hands. I began to snicker, which raised her ire again, “Shut up, rodent!” Just then, the door swung open and in walked Mr. B. “Uh, no one, sir.” she stammered. He looked at her with an odd expression. “Well, let’s get Mr. Livingston loaded up and get over to St. Bart’s then,” he said. They got the casket loaded somehow, considering C J was still hopelessly glued up. Then they carried the flowers to the flower car and once everything was loaded, Mr. B left to go back upstairs to put his coat on. As the door closed behind him, C J decided she would have to take desperate measures to free up her fingers from the super adhesive’s bond: the scalpel! In one quick sweep, each hand was liberated, but blood now began to ooze where the cleaved fingers had been joined. She quickly grabbed a handful of band-aids from the first-aid kit, and we were out the door. “Nothing, really. I’m good, honest. A little problem with that darned glue, but it’s fine. Looks worse than it is, I promise,” she said in a rush. We got to the church and pulled in front of the entrance. The pallbearers and the family were beginning to show up and soon it was time to take the casket into the church, to the vestibule. This is where the monsignor would bless the body and the pall would be placed over the casket before proceeding into the main church. This is the part that always made C J nervous: getting the casket down the aisle, rolling it perfectly straight, as Mr. Becker walked backwards (facing her, as she pushed the head end). The morning had already gotten off to a rocky start with the glue incident, she prayed under her breath that she would keep that casket straight and above all: guide Mr. B down the aisle without bumping him into the crucifer! Rumor around the mortuary was that everyone who ever worked with Mr. B at the Catholic Church had made this awful, grievous gaff. As sure as the sun will shine, it was a prophecy fulfilled. 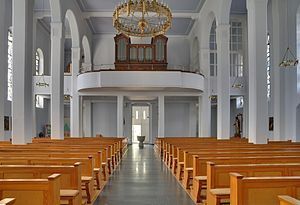 Not quite a third of the distance down the aisle (see anatomy of church as in the clip above), as she intently stared through the tiny ‘window’ of space ahead through the crook of his bent arm, C J somehow lost track of the candle-bearer’s step. In an instant, she knew she was doomed, as she felt Mr. B’s body run into slight resistance, if just for an instant only. CJ was gripped by panic! Judging from the deepening color moving over Mr. B’s face, I doubt she had any idea the trouble she was in! I crouched low in her pocket, the day was about to worsen. It was an eternity when we finally made it to the front of the church. CJ and Mr. Becker turned and genuflected before walking back together to the vestibule. 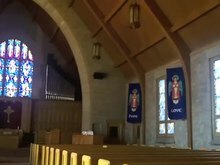 As they got to the double doors, Mr. B began to close one side, and C J started to close the other side…but the doors were still open when he launched into a very audible whisper-yell which echoed into the main church. “GODDAMN YOU!! You just committed a CARDINAL SIN!” he blustered. Several of the mourners actually turned around in the pews to look back. It was a most awkward moment, more so than the casket incident a few minutes earlier had been. The doors crashed closed with a mighty slam. C J shrank, red-faced, shaking, and tears began to roll down her hot face. She looked like a shamed child. She fought to stifle a sob as he stared her down with a glare that could cut. She knew she had done the unforgiveable, appeared unprofessional. He worked hard at presenting flawless funerals. She would now be banished from working the Catholic services after today. C J nodded, trying to apologize as she choked back the sobs that were stuck in her throat. He looked as if he truly hated her at that moment. We did as he said. After finishing at the cemetery, we came back to her little office to wait. I felt sorry for her as she cried. She felt just awful. CJ just stayed at her desk in her darkened office for the rest of the day. I never saw her so upset. She cried and cried. The worst part of it all: Mr. Becker never did come down to talk to her, either. *The next time Mr. B and CJ did happen to be in St. Bart’s again for a service was sadly, not to work a funeral…it was for CJ to attend Mr. B’s farewell, several years later, officiated by none other than the fine Monsignor himself. This entry was posted on November 27, 2013 at 1:20 pm and is filed under Cemetery, Death, Embalming Room, Funeral, Funeral home, Funeral Service Professional, Mortuary with tags Casket, Catholic Church, Death Care, Funeral, Funeral Mass, hearse, processional. You can follow any responses to this entry through the RSS 2.0 feed. You can leave a response, or trackback from your own site. Finally got the notification of this post, thanks. I sure you’re glad that day is gone and done with… wow! I thought I had bad days, hope you won’t have to go through something like that again. Happy Thanksgiving to you both. Oh, and Happy Thanksgiving from us to you, as well, dear friend! Peace to you and yours! Did Mr. B decided not to have the “talk” with CJ because he realized he was a bit harsh but was too set in the old ways to admit to it? I salut CJ’s courage, I would still haver my fingers glued, the thought of using the scalpel on myself makes me dizzy. I don’t know, Doggy. Will never know, as he is dead now. But I will say, ’tis true, never ever did work another Catholic Church service with him again, which was standard punishment. It killed me, too. Especially when the Monsignor came to do a rosary at the funeral home during visitations. I wore a sort of badge of shame, in a way. Lol! The old-schoolers are stubborn when it comes down to doing things a certain way, looking polished…I learned the hard way. And yeah! My fingers hurt like HELL! I never have been good with super glue to this day, not even around the house! Thanks for the salute! I had lots of courage when it came to blood, haha! Got to see plenty down in the prep-room! I wonder if Mr. B never made mistakes. Poor C.J. 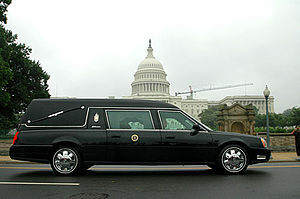 Perhaps Mr.B should consider changing ends of the coffin in the Catholic Church and see whether he can drive straight.